Using Chrome for signage is a solid choice for projects. Chrome devices are built to keep working with simple, redundant architecture and no moving parts. Chrome OS is a secure, platform built on a solid architecture making this platform a great for Digital Signage. We are also a Google Cloud Chrome Technology Partner. Similar to Intel®’s Compute Stick, Asus’ Chromebit is a ‘chocolate-bar’ sized computer, great for Digital Signage on a budget. Boasting a Quad-Core Rockchip Processor, the Chromebit boots up in seconds and delivers full HD graphics in conjunction with automatic updates ensuring you’ll always have the latest software. For projects which need a bit more power and longer run times, AOPEN deliver Chrome specific, commercial grade devices. 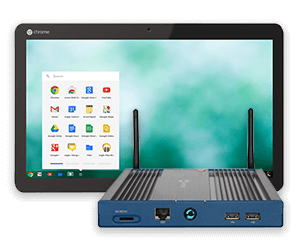 The AOPEN Chromebase features a 22″ Full HD display, a tough, tamper-proof, fanless design for 24/7 operation and an Quad Core Intel® Processor. AOPEN Chromebox is an Ultra-slim ruggedised media appliance with similar specifications to the Chomebase but for external displays. Both devices come with a 3 year warranty as standard. Easily deploy embed signage to multiple Chrome OS Devices in minutes using Chrome Device Management. 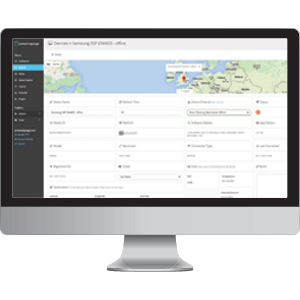 By enrolling devices in a domain and using Chrome Device Management users can configure embed signage to run in Kiosk Mode in a matter of minutes. Check out our demonstration video to see how easy and quickly it is to get a Chrome Device up and running for Digital Signage with embed signage in Kiosk mode. Engineered within embed signage are a range of network management tools. Using the device controller feature, you can remotely reboot your chrome device from anywhere with an internet connection as well as schedule reboots daily or weekly*. Through the embed signage devices dashboard, you can view Chrome OS hardware statistics such as model, software version, resolution and when its received it’s channel of content. Start using Chrome OS for digital signage today by downloading the embed signage app from the Chrome Web store to your chosen Chrome Device.